Pumpclip Parade: Lymestone Brewery - "Sharon Stone"
This image was submitted by Ian Bradford of .... LYMESTONE BREWERY! It seems Mr Bradford was impressed by the boost to sales Slater's received when their "Top Totty" hit the national news. Here the Staffordshire Newsletter's report on this atrocity. Notice the very last line, Mr Bradford offers a version of the facile "it's just a laugh innit?" defence. 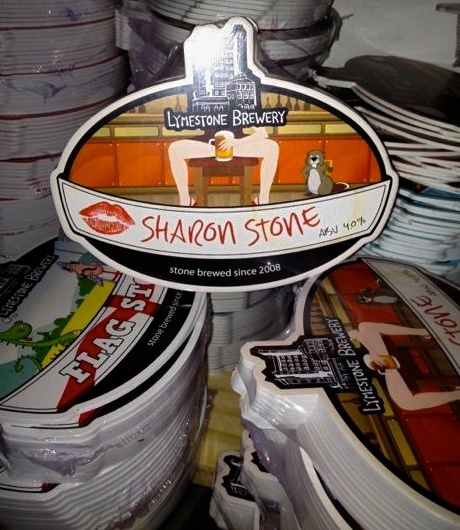 A CHEEKY new beer from a Stone brewery has got Staffordshire publican’s knickers in a twist.Sharon Stone by Lymestone Brewers is a very traditional copper-coloured English bitter, but it’s the racy artwork – poking fun at the infamous Basic Instinct leg-crossing scene – that has left a few landlords blushing. Head brewer at Lymestone Ian Bradford, or Brad as he's known, said: “One or two of the pubs who we have supplied it to are just getting around to putting it on now and are suddenly realising what they’ve got on their hands. “They’re getting in touch and asking if we have anything else they can use on the pumps instead, because they’re scared of frightening the natives,” he said. Mr Bradford said the brewery, who have the word stone in the title of all their beers, had been waiting to use the Sharon Stone name since first starting up four years ago.They finally got their chance eight weeks ago when they created a the new beer working alongside a Leeds-based wholesalers called Beveridge Express. “They had a saleswoman called Sharon so we named the beer after her,” said Mr Bradford. “She thinks it’s great and they’ve already sold all of their supplies. Mr Bradford said: “When the designers sent us the artwork back we fell about the place laughing.”He admitted the decision to use the risqué artwork had been partially based on the hope it would bring in some publicity, especially after neighbouring brewery, Slater’s, had such success with Top Totty, a beer popularised after it was removed from the House of Commons bar when someone complained about the pump clip. Beverage Express rather than "Beveridge Express", surely? Unless they specialise in high speed social reform. “When the designers sent us the artwork back". Designers?! They paid someone to do that? !